On 11.11.11, I had the pleasure of delivering the following at TedxPhoenix (see http://www.youtube.com/playlist?list=PLEBA22ED9AF4194B5&feature=view_all for the video). Experience failure for a change. Experience. Why is experience important? Experience is a way of learning – and it’s a way of learning that “sticks.” John Dewey understood this when he and his wife Alice founded the Lab School at University of Chicago over one hundred years ago — the place where the concept “learning by doing” was the guiding principle. 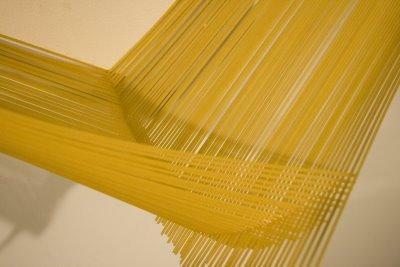 Math, for example, were taught by having children – young children – cook real food in a kitchen. They experienced the application of math and so learned its principles. They experimented. Sometimes they got it wrong, but sometimes they got it right. And they learned. Learning to fish is a good example of learning by doing. We’ve all heard the adage, give a man a fish he eats for a day, teach a man to fish, he eats for a lifetime. One does not learn to fish by reading about lines and sinkers and taking a standardized test. Instead, the student casts a line into the water over and over again. If lucky enough to have a mentor/teacher, the mentor teacher coaches the student on how, where and when to cast the line. Thus the student fisher learns to fish by experiencing fishing – and so independently and self-reliantly eats for a lifetime. So, experience is a way of learning but failure is…well….failure. Brain scientist Jason Moser at Michigan State recently isolated our reaction to failure. While the initial reaction is negative, there is a second positive reaction to failure that, if sustained, indicates attention to and learning from mistakes; from failure. 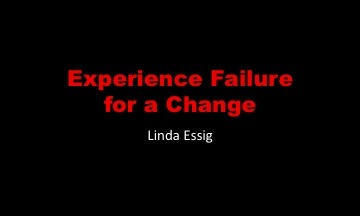 What does the experience of failure teach? What is it that we can we learn from failing? What can we learn from being given the opportunity to fail? 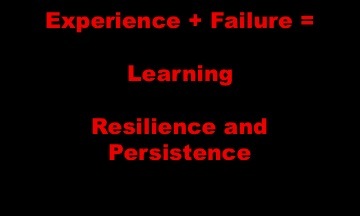 Experience plus failure teaches resilience and persistence. Why are resilience and persistence are important? Resilience and persistence are habits of mind. They are thoughtful, intelligent behaviors. For artists and other people My interest is not in entrepreneurial behavior in the commercial marketplace of small business creation, but rather in the entrepreneurial behavior that supports artists and artistic creativity. How can we help artists be more “entrepreneurial?” More persistent, more resilient? And in doing so, help them to successfully get their art – their creative products – in front of their audience. Artists who are habitually persistent and resilient will not only persistently create work, they will – even if – and perhaps becausethey fail – resiliently and persistently keep putting their creative work in front of an audience until, like the proverbial spaghetti on the wall, it too sticks. The “show must go on” mentality of the arts conservatory may be doing a disservice to emerging artists. Instead, we can create an environment where artists can not only experiment with new forms of art, but also with new business models for the arts. That’s why I’ve devoted the last few years of my professional life to a university-based arts venture incubator. So, lets encourage artists to develop work – and ideas for disseminating that work – that “stick” ; by providing environments in which failure is not only accepted but encouraged as a learning tool. Through failure, artists — and other people — can develop the habits of mind necessary to be successful. Thank you. This entry was posted in Arts education, Arts entrepreneurship, Arts funding, arts infrastructure, Higher education, Uncategorized and tagged Arts education, arts entrepreneurship, Creativity, Higher education, p.a.v.e.. Bookmark the permalink.